I spent hours pouring over Radio Shack catalogs thinking about which one I should get (calculating a careful balance between cost and potential). 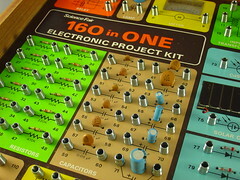 When I finally did get one of these kits (actually, I think it was this one–it looks eerily familiar), it was cool but very cookie cutter, and didn’t really teach anything about electronics. Somehow I never made the conceptual leap into circuit hacking that seemed so easy when confronted by a computer language. I don’t think I really understood circuits until I took 2nd year electrical engineering courses, and that was 100% theoretical–no soldering required. I’ve always puzzled over why programming triggers such powerful attraction with so many people, but other disciplines, which are arguably similar, don’t. Electronics is one of these. Like programming, it’s component-based and consists of puzzles and features (relatively) instant feedback. But it doesn’t quite engage the same broad section of people. A more extreme case is math. I’ve always been much more respectful of strong, natural math skills (which I have to work hard at) than of programming or general computing skills (which I find comparatively easy). Check out the wired article about great 80s geek toys.